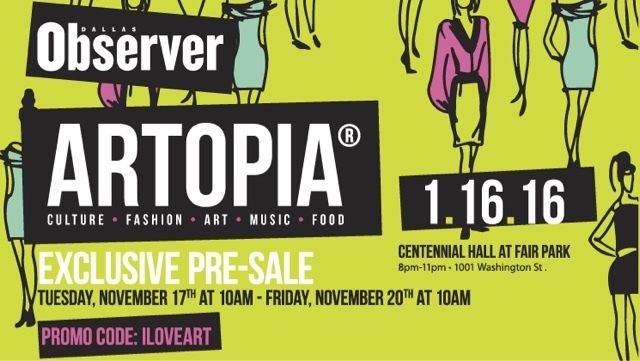 We are roughly two months away from the Dallas Observer's annual Artopia event and pre-sale started today! If you're not familiar, Artopia is a celebration of Dallas Culture & Art that incorporates food, drinks, art, music, and fashion all into one! This one-night fete celebrates the exciting, vibrant Cultural scene in Dallas. And the BEST part is... the event supports local artists with monetary grants for the service they provide to the Arts and to the Community. The Dallas Observer will be donating over $6,000 in grants to the Mastermind Awards winners. Check out the official video from last year's Artopia here. Be on the lookout for an exclusive giveaway I will be hosting as we get closer to the event! See below for more details on the event. Art by the Dallas Observer. I hope to see y'all at this event! It will be a lot of fun!